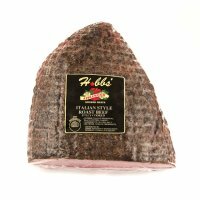 Hobbs' features meats only from the finest animal stock and premium cuts. Great personal care is taken in making our selections. Our long-tem relationships with breeders and farms in California and the Midwest ensures that your customers will enjoy the quality we monitor every step of the way. 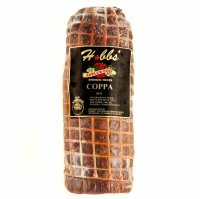 For our pork products, we have selected a three way cross, which we feel gives us the best of certain characteristic in each breed. The sire must always be Duroc. This gives very good muscle mass. The mothers are a cross of Landrace and Chester White. These are a longer animal and have good mothering attributes. Raised in clean, uncrowded surroundings, these hogs receive a vegetarian diet, without the addition of any animal by-products. The natural pork is fresh, minimally processed and contains no artificial ingredients. Our salamis, prosciutto, pancetta… and more… are created in the tradition of the Old World, using time-honored methods and special recipes to carefully season each selection. We always follow the same uncompromising standards set by our founder, Hobbs Shore. Select any image or subhead to view complete product descriptions.